When you’ve found a best friend in the pet that you cuddle each and every day, it’s hard not to prioritize their health the same way that you would your own. From removing teeth and visiting eye doctors to the number of vitamins their taking and exercise they’re getting, your pet will quickly become a part of your family. This case is amplified when you are someone that relies on a service dog. Regardless of whether it’s anxiety, seizures, blood sugar or communication that your service dog provides, having to rely on them creates a bond unlike any other. In the month of May, you and your furry, four-legged friend can attend the ACVO National Service Dog Eye Exam Event. This philanthropic event is dedicated to providing free, ocular eye exams to animals that help you every day. Thanks to the American College of Veterinary Ophthalmologists who volunteer their time, service dogs can have their eyes examined for free to ensure that they’re in a good, healthy state, but also, that they can continue to provide care. Animal Eye Associates is excited to see such an important aspect of your pet’s health receive this amount of attention. Routine eye exams can be difficult to budget when you’re in a state of disability that keeps you from working or are juggling medical bills, but the health of your primary caregiver is something that should be prioritized. 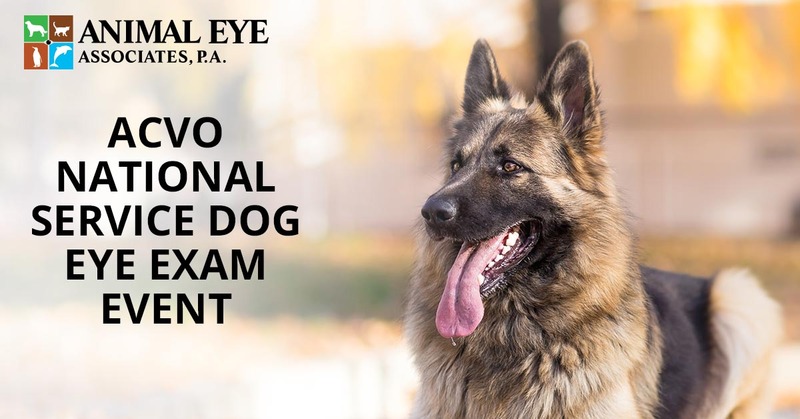 If you have a service dog that hasn’t had their eyes examined in some time, make sure to mark the ACVO National Service Dog Exam Event on your calendar. This is a great opportunity to take advantage of and allows for you to return the favor of care that your dog continues to provide you with. If you’re unable to attend, reach out to Animal Eye Associates, P.A. and schedule an appointment with one of our team members.